Apologies are hard. Because I don't like to be wrong, let alone admit it. Ask Little Sissy Pham - when we were kids (and into adulthood if I'm honest) I'd argue with her until she agreed I was right even though I knew I wasn't. Only when she'd admit defeat did my fat ego then apologise for being wrong. I have serious issues. Sometimes it's too hard to apologise to someone but Apomogy makes it easy if there's something you want to get off your chest - like say, accidentally killing someone's mother...?! Apomogy is anonymous apologies expressed on pom-poms because obviously - it's called an apomogy. 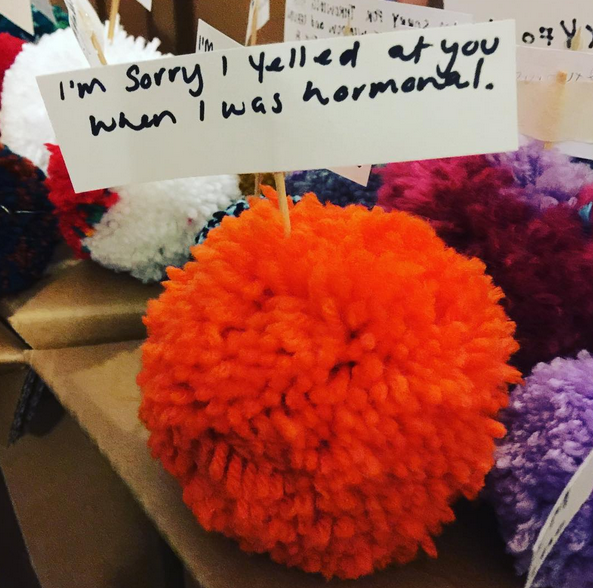 It's an ongong group art project about saying you're sorry with the help of the almighty pom-pom. Follow @apomogy on Instagram because not all social media is gratuitous, some can be heartfelt and delightful!